Bruce Springsteen has joined with a Detroit-based soul man who emerged from the rubble of a lengthy battle with cancer with the most remarkable album of his three-decade career. 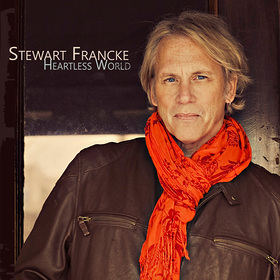 The wry and rocking ‘Heartless World’ from Stewart Francke (out May 31 on Blue Boundary Records) kicks off with “Summer Soldier (Holler If Ya Hear Me),” a narrative about a young Michigan soldier entrenched in the war in Afghanistan, made even more powerful with Springsteen’s call and response vocals throughout. The powerful, organ-based track is mixed in with lighter songs in the vein of heartland idols Tom Petty and The Band, such as “Boo Yah (Take My Mother Home),” featuring his friend legendary “Detroit Wheel” Mitch Ryder. “This whole album is about trying to find a place to make a stand in the world, after all of your foundational pillars have gone to dust,” Francke says of ‘Heartless World,’ his first album in six years. "It’s through these songs that I’m trying to construct a world that I want I want to live in – a world where I remember the best things about the people who are gone, a world where we look out for each other. After his bout with cancer, looking out for others became a top priority for Francke, he created The Stewart Francke Leukemia Foundation and raised $50,000 for the National Marrow Donor Program (NMDP) and $92,000 for the Field Neurosciences Institute in his hometown of Saginaw, Michigan. On September 17, Francke will receive the Twilight Award for cancer involvement and musical outreach in Detroit from the Twilight Benefit Foundation. A true road veteran, Francke got his start at 19 playing bass with Chuck Berry, and has since shared the bill with artists including Sheryl Crow, Steve Earle, Steve Winwood, The Funk Brothers and Bob Seger, a friend of Francke’s who will share the stage with him this month in Cleveland. Francke has also earned 13 Detroit Music Awards including Best Artist, Songwriter Album. Listen to “Summer Soldier (Holler If Ya Hear Me)” on People.com.